The combination of music dating from around 1560 and the Ensemble Ordo Virtutum is remarkable. The ensemble focuses on much older music, dating from the 12th century or before. The reason that the ensemble has turned to music from the pen of Manfred Barbarini Lupus is that stylistically it is rather old-fashioned. In his liner-notes Stefan Johannes Morent puts the music into its historical context. It is closely connected to the convent of St Gallen to which the ensemble has already devoted another disc, "Sequences, tropes & Gregorian chants from St Gall Abbey" from the pen of Notker Balbulus.s. The entry on Barbarini Lupus in New Grove consists of merely two paragraphs. He was born in Correggio, near Reggio Emilia, in Italy. In 1557 he became Kantor in Locarno in Switzerland. On his travels northwards he met the Fugger brothers in Augsburg and at Freiburg he probably met the theorist Glarean. It is probably also on one of his travels that he visited the monastery at St Gall as its abbot, Diethelm Blarer, commissioned him to compose four-part arrangements of the chants used in the monastery. That is also the last sign of his existence. It was Blarer who attempted to restore the liturgical practice in the monastery which had gone through rough times in the early 15th century. The Counter-Reformation which was the Roman Catholic Church's response to the Lutheran Reformation was a further incentive to his attempts to save the central place of the traditional chant. This place was not only in danger as the result of the Reformation - which also took place in Switzerland, under the leadership of Ulrich Zwingli - but also as a result of musical developments: the dissemination of the art of the Franco-Flemish school with its polyphonic webs in which chant, if present, was often hardly discernible. This explains the way Barbarini treated the material in his settings. "Except in a few cases, the plainchant on which each piece is based is notated in Gothic neumes in the tenor part, while the surrounding parts - Discantus, Altus and Bassus - are written in white mensural notation. The rhythm of the tenor is such that every note of the plainchant is given in equal semibreves. This special form of composition and notation was not an invention of Barbarini's, nor of St. Gallen. It is already documented in tracts and certain compositions (such as the Jena Choirbook 35) from around 1500." Morent also emphasizes that this relatively simple polyphony does not indicate that St Gallen was not acquainted with the compositions of the Franco-Flemish school nor that the monks were unable to sing more demanding music. It is interesting that the music by Barbarini was included in two choirbooks and that Blarer commissioned a conventual of St Gallen, Mauritius Enck, to write the "apologetic prefaces" in the two books. He had studied in Paris and with Glarean in Freiburg. 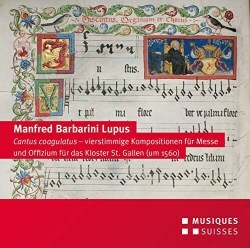 "Enck writes that the particular connection of cantus planus and musica figurativa, such as is found in the two codices with Barbarini's music, results in a cantus coagulatus. The various translations possible for "coagulatus"- "coagulated", "converged", "agglutinated", here convey the central, immutable role and position of the chant, and the compositional principle of bringing together what is in fact disparate". This disc includes a number of liturgical works, divided into three sections. The largest part is entitled "In festo Sancti Galli", referring to the saint who settled as a hermit in Gallen and is considered the founder of the convent. It opens with music for Vespers, and continues with music "Ad missam". Here we not only hear the Ordinary but also the Propers: Introitus, Alleluia, Sequentia, Offertorium and Communio. Many chants are of an alternatim character: the verses are alternately sung in plainchant and in polyphony. Some settings are in fauxbourdon style, such as the Magnificat. In this recording the organ plays a prominent role. The organ tablature of the St Gallen organist Fridolin Sicher (1490-1546) documents the role of the organ in the liturgy of the monastery. In Blarer's time the organist was Heinrich Keller who also copied Barbarini's music. He added the indications chorus and organum to the vocal parts. It means that the organist can play the sections marked with organum in the way of intabulations, either alternately or together with the singers. In this recording Roland Götz made his own intabulations in the style of the 16th century. In the Gloria the verses are alternately sung - in polyphony - and played. In the sequence Christe sanctis unica spes the even verses are sung polyphonically, the odd verses are performed by the tenor, singing the cantus firmus, with the organ taking care of the remaining parts. The latter practice is also followed in the last piece on this disc, the sequence Sancti Spiritus, for the feast of Nother Balbulus, monk and teacher of the convent around 1000. Before that we hear a hymn for the feast of St Otmar, the real founder and first abbot of St Gallen: Rector eterni comprises eight stanzas which are sung alternately in plainchant and in polyphonic settings by Barbarini. The Ensemble Ordo Virtutum focuses on liturgical music, especially music as written and performed at convents in the Middle Ages. This disc, with its repertoire which it stylistically close to what was written and sung some centuries earlier, fits well into its field of expertise. This is music which is largely ignored by the vocal ensembles specializing in renaissance polyphony. If Barbarini's mass as sung here would be performed separately it would probably be considered as too simple or even, as Morent writes, "substandard". This kind of repertoire needs a liturgical and historical context and exactly that makes productions like this so worthwhile. If you just want to listen to a complex polyphonic fabric, stay away from this disc. But if you are interested in early liturgical practices and want to learn about how liturgical music was used on a day to day basis in St Gallen - but also, mutatis mutandis, in other convents and in churches - this disc is a highly interesting and compelling addition to your collection. It is regrettable that the booklet omits English translations of the lyrics, though. The singing of the plainchant is excellent, as always, and for this recording Morent has invited four fine singers who have perfectly grasped the character of the polyphony and whose voices blend immaculately. Roland Götz deserves accolades for his creating and playing of the intabulations.